Hot and bothered at the library. | thoughts. Hot and bothered at the library. I just got back from my local library; I have a new shiny card tucked into my wallet, replacing the one with my maiden name from the Uptown library that I signed up for two years ago, but never used, not even once. It’s embarrassing that I haven’t had a library card (with the intention to use it) since high school, almost seven years ago (using my college ID at Preus Library doesn’t count). I meant to get a card this summer, as the St. Louis Park library is literally across the street from our apartment. I meant to get a card this fall, when I realized all over again that there is no valid reason to buy books instead of borrow them. I’ve been meaning to get a card for the past three wintry weeks, when I found out I could read books on typography at work and get paid for doing it. And although there are a few volumes on typography I wouldn’t mind having on my shelf, I prefer something free right now. Anyways. So I finally get to the library tonight. The librarian’s glasses perched precariously on the tip of his nose and he never cracked a smile. After I asked for a card, he asked if I’ve ever had one, and I replied no…and he exclaimed, “Never?” I didn’t go into how I meant not in the Minneapolis area…how for years I carried the bright yellow Monroe card although I rarely used it anymore…BUT, I knew all the librarians by name and they knew mine, so there! Instead, I just confirmed with a nod, so he got me that spankin’ new card, tried to clarify how Hennepin County and Minneapolis library systems are separate, although they will soon merge, and that if I register my card with Minneapolis I can use both systems, even though Minneapolis is IN Hennepin County. Whew. The return “drop” was a moving belt, like at a grocery store; there were three dozen computer stations filling the heart of this little building; there was a self-checkout station. And an express reserve pickup area. I was embarrassed that these things surprised me; I was embarrassed that this librarian knew it; I blushed when I asked how long I can check books and DVDs out for. I honestly don’t remember what the overdue fee was when I was growing up in Monroe, but I do know that I was relieved it’s thirty cents here instead of something much more expensive, although if it was something like two dollars, I wouldn’t be surprised as it would’ve been much more aligned with what I’m discovering about adult life (costly). So, I did it. And I put a few typography books on hold. And yes, I’ll be notified by email, which is one thing I do remember setting up at libraries. Also. Just to clarify, I actually do believe there are valid reasons for buying books instead of borrowing them. However, at this point in my life, as our bookshelf is drowning in stacks, I figured I should try a little harder to save a couple bucks. 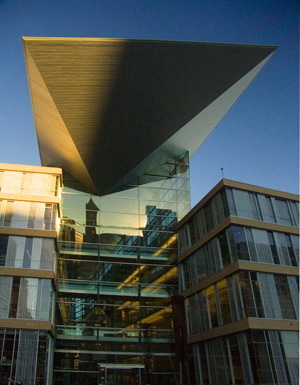 Below is the Minneapolis Central Library, which is where I need to register my card for access to even more books. If I was blushing in St. Louis Park, I don’t know if I should show my face in here. Have I mentioned that since we last talked, I’ve become an almost librarian? (I just have to get that pesky master’s degree…) It’s pretty much my dream job, even though this combined with my love of cats and knitting puts me at a severe risk of becoming a spinster – even my boyfriend says so. Anyways, this blog entry warms my heart. I am scared of that architecture! Is that thing going to land on my head if I forget to return a book! YIKES!